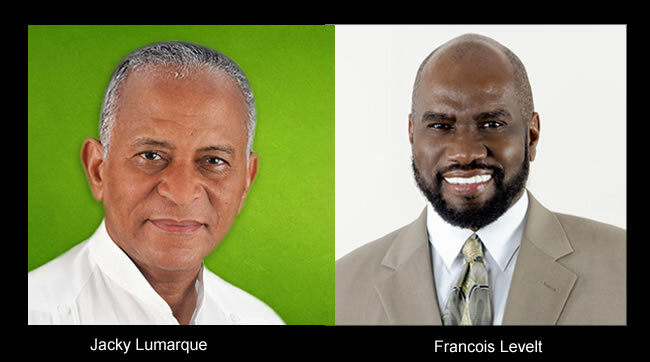 Here are the pictures of Jacky Lumarque and Francois Levelt, tho candidates for the presidency of Haiti who were rejected by the CEP. Jacky Lumarque was disqualified for lack of discharge and Francois Levelt, for drug trafficking. The Provisional Electoral Council (PEC) on a press release dated June 19th, 2015, has informed its decision to remove the names of two presidential candidates Jacky Lumarque, a candidate running under the banner of former President René Préval's Verite Party and Francois Levelt, representing the banner of the Haitian Diaspora Party for Haiti (MUDHAH). Jacky Lumarque has been expelled from the presidential run because he could not produce his discharge certificate as required by an election decree as per its mandate mentioned in Article 90 paragraph. The candidacy of Francois Levelt has been withdrawn because he was convicted on transnational crime for possession and trafficking of crack cocaine in the United States of America, which is an act in violation of article 36, paragraph (c) of the Electoral Decree.